Property 8: Between nature and magic .....! 2 Bed Modernised Barn with Pool, within easy walking distance to Town. Property 16: 2 Bed Modernised Barn with Pool, within easy walking distance to Town. Large portion of ancient stone countryhouse on the hills north of Lucca. Private garden. 10 km from Lucca. Property 17: Large portion of ancient stone countryhouse on the hills north of Lucca. Private garden. 10 km from Lucca. Casale Le Mandolate typical Lucchese farmhouse 8 KM from Lucca. Property 33: Casale Le Mandolate typical Lucchese farmhouse 8 KM from Lucca. Old mill of '700 with a sea view and private pool. Lucca Comics. Property 41: Old mill of '700 with a sea view and private pool. Lucca Comics. 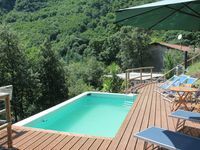 Fantastic Villa close to the centre of Lucca- fantastic pool - wifi. Property 43: Fantastic Villa close to the centre of Lucca- fantastic pool - wifi. Great property and very gracious hosts. The rustic villa is ideally located just outside Lucca and close to everything around. Our hosts were very helpful in providing information as well as recommending what there was to do and see in the vicinity. The villa is very romantic and cosy. We would definitely recommend it to everyone.